Crossing the last border was on our minds, we had worked on our route while resting and enjoying the features of Darjeeling. This was our last real stop before heading into the Himalayas on our way to Kathmandu. We stayed fourteen days in Darjeeling to rest and enjoy our journey. We had a chance to do some socialising and met several cool people and enjoyed the relaxed feeling of the hillside terrain. Soon we would be heading of towards the final country of our journey and we were mentally preparing for this last stretch. In Darjeeling we stated a the Long Island Hotel a small family run place with all what we were looking for after cycling in the rough north east of India. We found the regular places that suited us and frequently visited these places. A Tibetan restaurant called Kunga was a real treat with great food and a friendly staff. For lunch we would go to Glenary’s and enjoy a grilled chicken sandwich and a lemon soda. While staying in Darjeeling we explored the nearby places such as the Happy Valley tea garden. The tea garden give a free tour of their factory and to our surprise they only do tea and no happy “substances”, the Darjeeling tea is a famous tea we were told. One of the days we wandered down the mountain to visit the Tibetan Refugee Center, a center created in the 1970’s when things were turning bad on the Tibetan plateau. We wandered around the place and had some small conversations with the people. As we have cycled in the tibetan regions of Amdo and Kham we felt quite intrigued by the place and the information they shared. On site there are some craft workshops with nice carpets and fabrics. We had some short conversations and asked where the people originated from and could envision the areas where they had lived before. A nice little day trip it was. We had packed and were ready to go but then we thought let’s stay another day. This has become a habit as we then have a day where all is ready and we do not have to pack too much in the morning. The next day we left Darjeeling and cycling out of Darjeeling is hectic as there is only one narrow road connecting the city and there were as always road works and many sumo’s. The road soon got better as we turned away from the main road and followed a smaller road to the town Mirik, a beautiful area as we were cycling with a great view of the lower Himalayas in Nepal and were surrounded by many tea gardens. In a village where Martin was waiting for Susanne to catch up, Martin was greeted by an old man who had served with the British army just after 2nd world war. He was a kind old man at the age of 94 speaking fine English and was very interested in our journey. The road follows the Indian and Nepali border there are some amazing views of tea plantations and hilltops really a nice road and mainly down hill. Down hill most of the way meant that we reached the border town just in time to find a place to sleep for the last night in India. Panitanki is the last town of India and just in style with the rest of the towns in the area dirty and chaotic and hot in this period of the year. 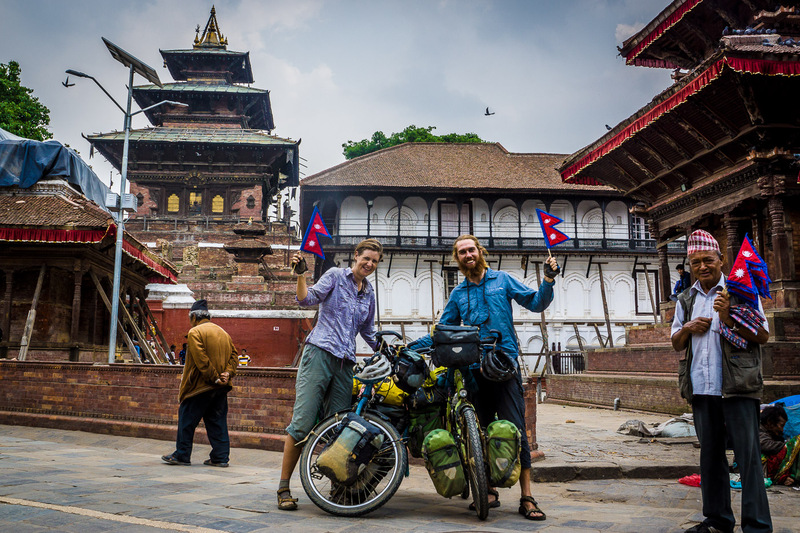 We cycled around town contemplating on going to Nepal as rumours had it that there would be more hotels there. We stayed so we could enter Nepal fresh in the morning. The next morning we were at the Indian Immigration at 7 to be stamped out and there it was the last border crossing on our journey to Kathmandu, so close now!! Little did we know about the route we had planned through the Himalayas. Entering Nepal was very easy no checks of any kind. We payed 100usd for our 3 months visa, nice to have time and not to be worried of the visa. Finally we had made it to our last country of the journey, what a feeling! First things first exchanged some Indian Rupees to Nepali, found the only ATM got more money out, bought a local sim card and charged it. Then we cycled out of the city in the morning sun already warm, what a heat it was so intens to cycle in. Ilam was our next city when people asked. We took a right from the main road and soon we were climbing again as we were now at 300m and on our way to the first peak at 1700m due to heat and some issues with our Magura brakes we stopped early in the town of Budhabare. Martin tried to bleed the brakes of Isaba but not with great succes, little gain of braking power. So he switched handles so Susanne could brake with the rear brake and less with the front. This solution should make it to kathmandu, again little did we know of the route ahead. We made it up the first mountain in Nepal near the town Fikkal, here we met 2 workers from an organisation supported by the Danish government called Unnati so had a small chat with them. Stopped in Fikkal for the night and found a little hotel with restaurant. There we had our first dhal bhat this would be our lunch and dinner for the next two weeks, we just didn’t know yet… In Fikkal we had tried to find packaged milk to prepare oatmeal in the morning. We were told that there is no packaged milk. Milk is brought into town every morning by packed small horses who carry large bottles of milk. We would see this more often: transportation on the roads and in certain towns people coming together to buy milk that had been brought into town from surrounding farms. We cycled out of Ilam and passed through many small villages, one is Hindu, the next Buddhist and so it changes from village to village. Stopped for lunch had a Chow-mien and some nice fried dough cookies. After some cycling up and down we reached Ranke bazaar a real out post and a mix of people. Here we stayed at KC hotel a wooded shack for 400rupees. We asked around for the road to Yasok and most people told us it would be a rough ride. Well at this time we were sure we had tried it all, so how rough could it be? 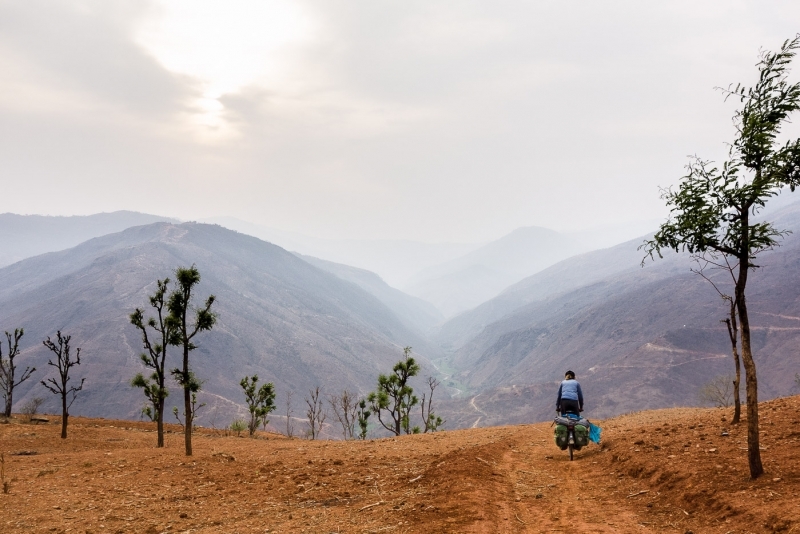 After a hot night at 400m we had to cycle back up on the other side to Myanglung – Terathum at 1600m in the scorching sun. We had a hard time after the dry hot night and headaches started due to dehydration. There are no towns or villages the first section up and the area is very dry. We had filled water at the workers camp, which we had treated with purification pills and it had been a good idea to do that. The uphill had some steep sections but the gravel road was not too bad so we made good progress and reached Myanglung just after lunch. Tired and a bit dehydrated we found a place to stay and had some lunch. We were quite tired from the last few days of bad sleep and hot weather and Myanglung seemed like an okay place so we decided to stay another day to regain some power. People were surprised to see foreigners in town so we had many stares and small funny conversations. We came across a man telling us about his work in Kuwait and that he had been back for three years because he wasn’t getting paid for the work he was doing abroad. We also visited the Haat, the twice weekly market where surrounding farmers bring their produce to sell it. The Magura brake on Isaba was now totally bad and Martin tried to fix it again with little luck and the handle just kept leaking. We agreed to cycle with the bad brake and see how far we could get. Luckily the road to Hile was not so bad, stayed mostly at altitude and no need for heavy braking power. Hile is a nice little town on the hills where the views of the great Himalayas should be very fine on a clear day, we have had no clear days. On the internet we found some info of a guy who had found a bicycle shop in a town just 2 hours towards the plains by bus from Hile. We decided to stay a day and go to Dharan in search of a V-brake to replace the Magura front brake on Isaba. The road was very windy and the bus was packed with people. It reminded us why we travel by bicycle and not as much by bus anymore. We had a hard time in Dharan finding the shop but we managed and got a full set of low tech V-brakes for 10usd. Took the bus back to Hile where Martin replaced the brake and we were ready to go again. Hile was a little surprise on our ride through the middle mountains with a nice atmosphere and apparently good views if you are lucky. We stayed at Gombu lodge across from the Tibetan temple and had dinner at their restaurant next to the temple. The town gave us a different feeling than the Nepal we had seen until then. We were happy with staying two nights there while we did the return trip to Dharan. Next up you will find us continuing on the middle mountain road and getting closer and closer to our final destination for our journey: Kathmandu! !